Pranams at the Lotus Feet of Pujya Swami Dayananda ji. It is our immense & greatest fortune to have come into contact with Pujya Swamiji who is the personification of Jnana, Bhakti, Karma Yoga all in one. It is a blessing that we had met him and studied under him at Arsha Vidya Gurukulam in Saylousburgh (Pennsylvania) and Anaikatti (Coimbatore) which Pujya Swamiji has established. We have great memories of Swamiji’s kindness, love and blessings. Swami Dayananda ji was inspired by Swami Chinmayananda ji when the latter conducted Bhagavad Gita Jnana Yajna. He thenn subsequently joined Chinmaya Mission, served Swami Chinmayananda ji intensely in many roles and was initiated into Sannyasa order. Pujya Swamiji has also studied under and guided by Swami Pranavananda of Gudivada (near Rajamundry) in East Godavari District, Andhra Pradesh. 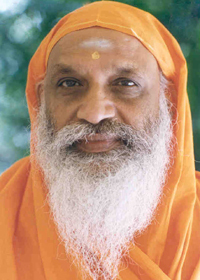 Swamiji later established Arsha Vidya Gurukulam in Saylosburg, Pennysylvania and Arsha Vidya Peetham in Rishikesh, India and has trained several spiritual seekers, monks in Vedants and the highest principles of Truth. He initiated many serious spiritual seekers into Sannyasa. Swamiji also is the founder of AIM for Seva or the All India Movement for Seva which helps people who are in need of education, money, opportunities etc. Pujya Swamiji has been teaching Vedanta for many decades and helping people try to come out of the mis-identification of the real Self with the various roles a person has in his/her daily life. Swamijis talks are packed with wisdom, wit, common sense, deep spiritual Vedanta and Sastra Pramana and simplicity. Swamiji’s talks make one’s ideas clear and focused towards goal. It will make us reflect, introspect and seek the support of Spiritual path more intensely. Swamiji is such a down-to-earth person that we see such personalities very rarely who is eager to help anyone irrespective of where he is. Please refer to the website Arsha Vidya Gurukulam for more info on Swamiji’s audios, videos, books.